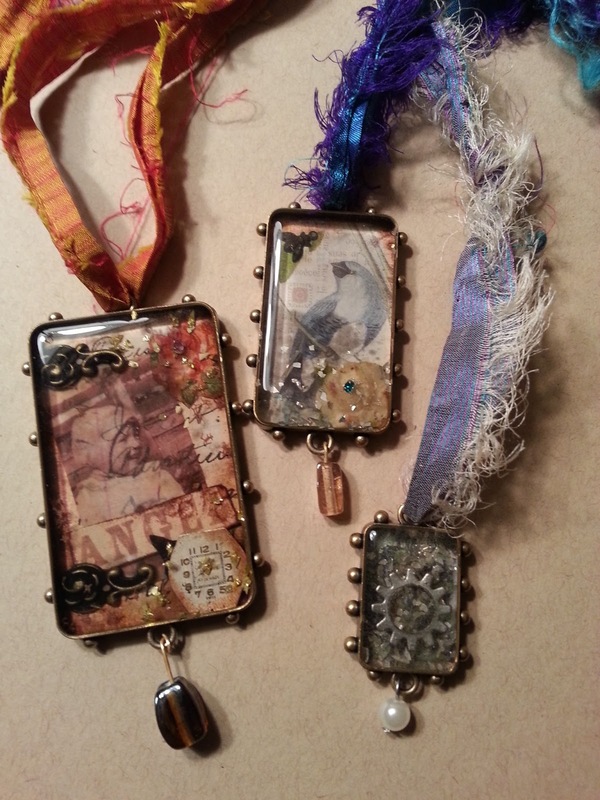 Hey friends, I think you'll love some of the works of art that came out of last week's Media Mixage Class, Personal Histories, at For Keeps Sake Paper Arts and Rubber Stamps in St. Louis...the student projects were amazing. We provided the basics for creating the pieces, bezels from Spellbinders Media Mixage and ICE Resin from Susan Lenart Kazmer...each student was asked to bring personal photos, handwritten letters or personal ephemera to use for the projects. 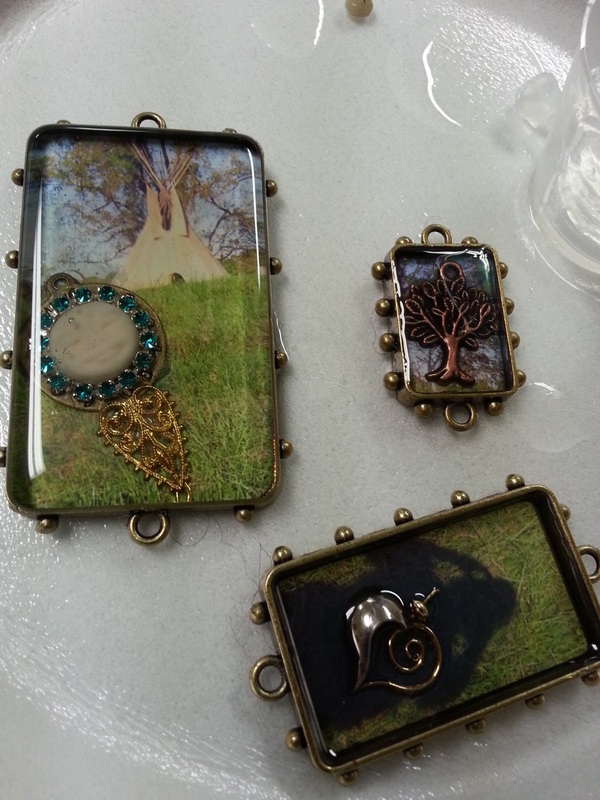 I was looking back through photos of the class and thought the projects we so beautiful and needed to be shared. 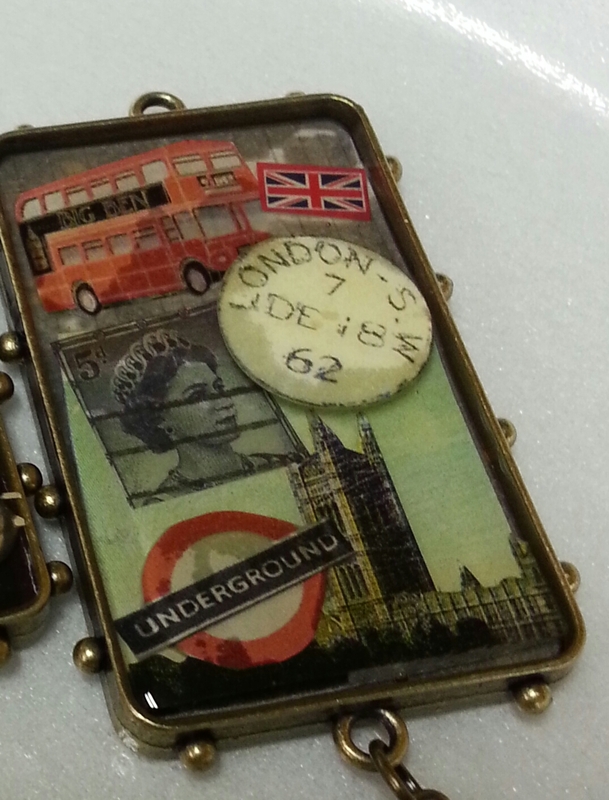 The bezels above were created with pieces of paper from a student's recent trip the the U.K. I love how this turned out...simply beautiful and a wonderful way to share her personal history...a trip to London. 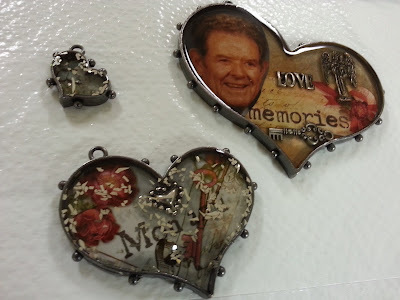 Judy created a tribute to her father...I loved watching her work on this piece...she put a great deal of love into it as she worked and reflected on her personal history with her dad....her project is just another way to share a personal history that is very meaningful. And she will wear this piece close to her heart...in creating this piece she really created a story-telling piece of art that is a lasting symbol of her relationship with her father. Even when students used only the pieces that we provided, charms, ephemera, beads and stones, the stories told were beautiful. 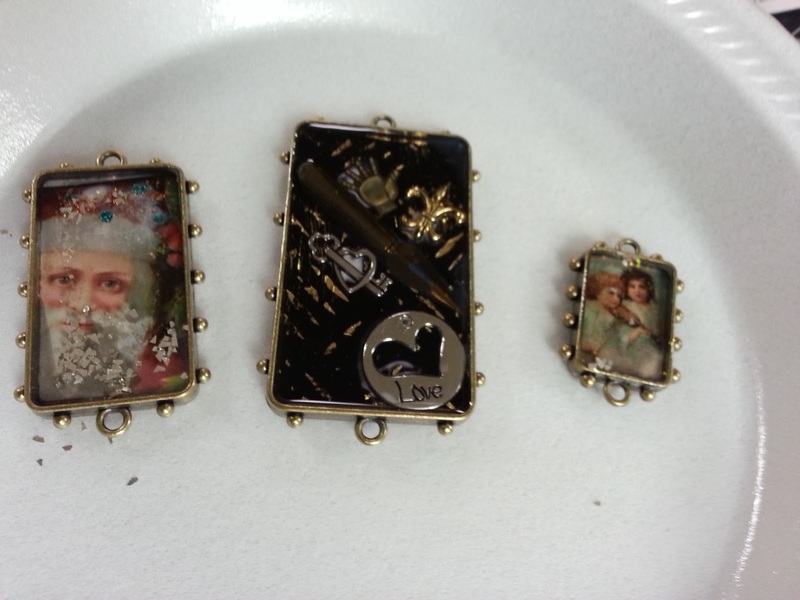 The vintage Santa bezel in the photo above would make an amazing package tie on or sweet gift at the holidays...and it's an instant heirloom it's so beautiful. 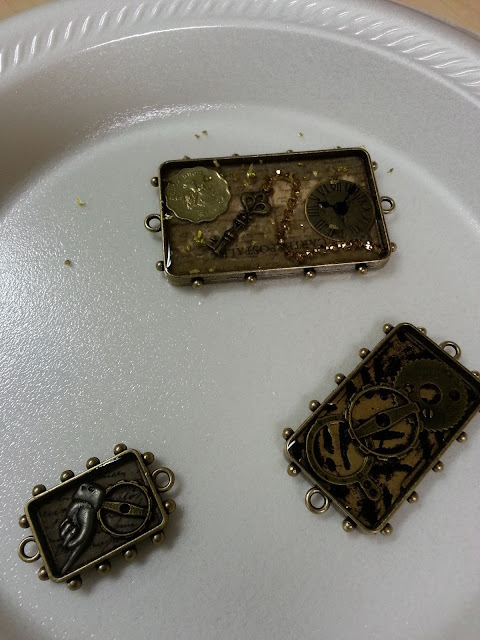 Watch parts and flowers look great under resin. 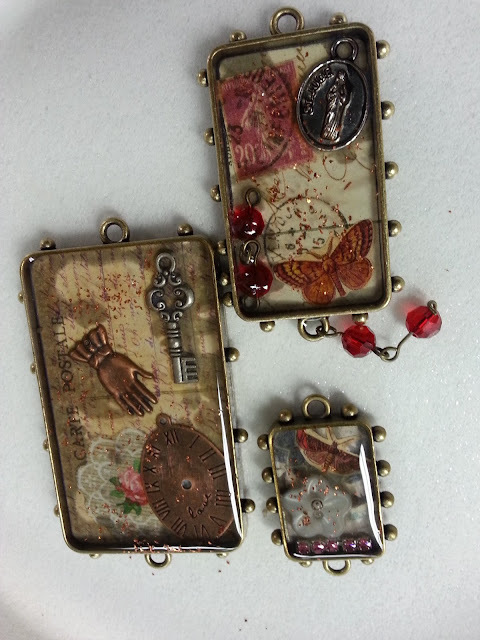 Each bezel is a little treasure. 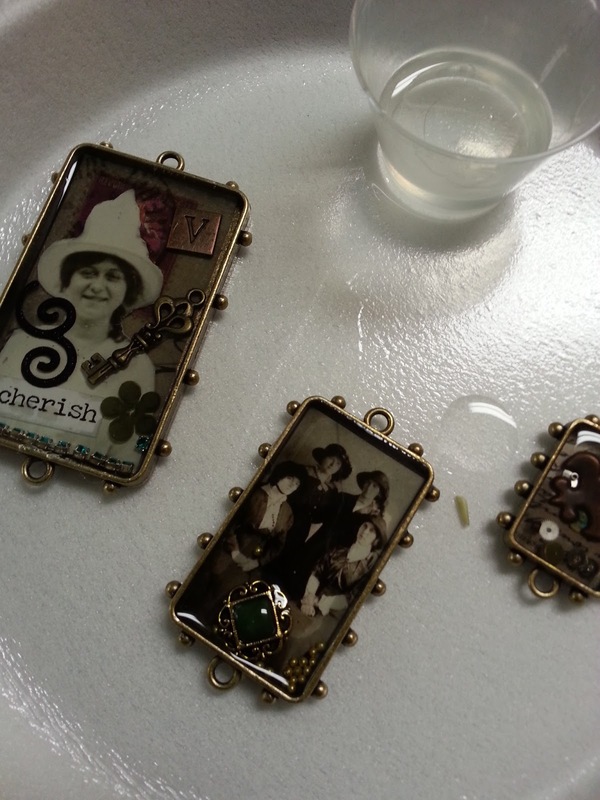 Vintage family photos and vintage buttons share a beautiful family heritage in this student project. Valerie used a school portrait of herself to create this beautiful piece...it will become another instant heirloom for her family. I loved it. These pieces were really cool too...a photo of a tee-pee looks great and preserves the memory of a family trip. I love the self portrait shadow bezel too on the bottom right. We used chunky antique glass glitter...you can embed it in the resin or float it on top...looks amazing. 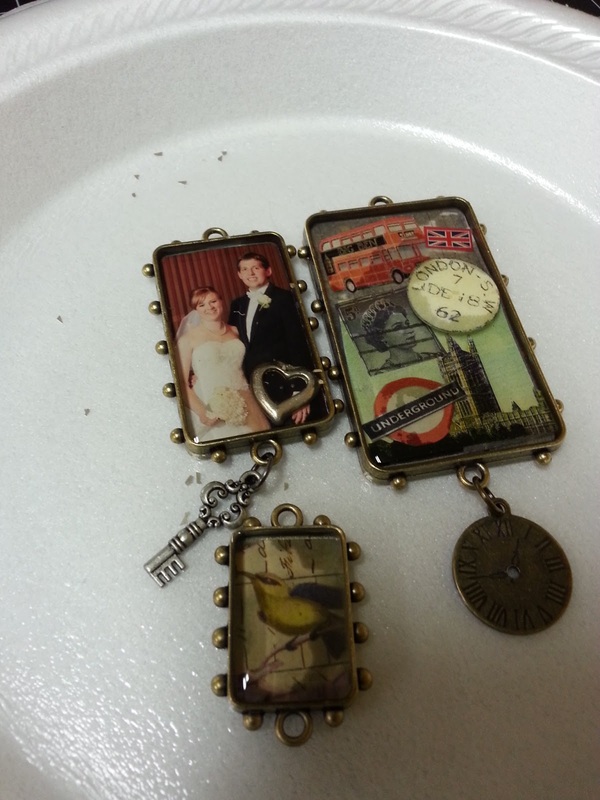 Wedding portraits look amazing in bezels and resin...it's a great way to commemorate that special occasion and a great way to symbolize the couple's love when paired with a heart charm. Wedding portraits would be great in heart bezels too. 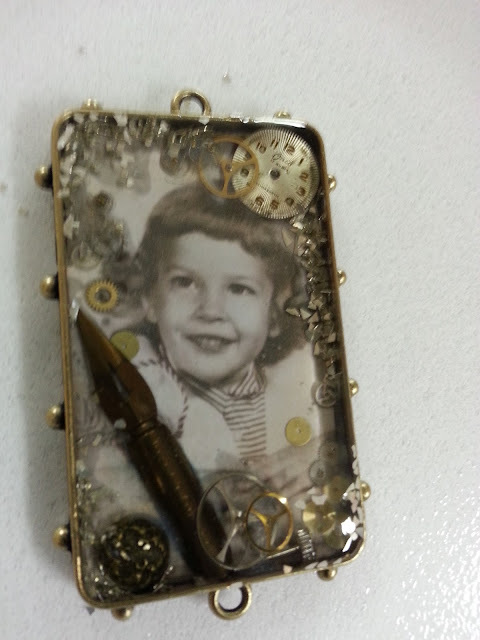 I love how Ann used a vintage photo with a vintage shoe charm... she also used a bird blank from Media Mixage to back her bezel. 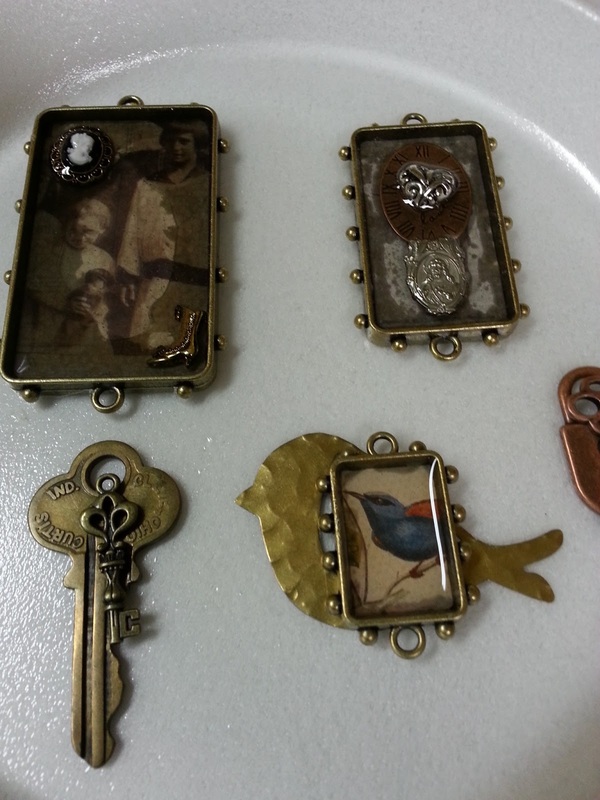 She affixed the bird and the keys to the left with ICE Resin...awesome techniques. In the bezel on the right, the student used textured art board to add wonderful texture as her background. I was really blessed and inspired to work with the amazing artists who took our class...I love watching the creative process and it's different for each person. I was also fortunate enough to have some friends in the class...here with Carolyn...she is a hoot and a half and makes me smile almost every day...and below with Ann and Sue...all amazing, accomplished artisans and crafters...it was a real privilege to work with them again...always inspiring. Thank you for stopping by today...the projects from our class were so amazing that I had to share them and I hope you'll be inspired to tell your story. Make it a great day and go create something beautiful! Thank you Allie, the student artists were amazing! Ken, you are one great teacher. All of your students projects are fantastic. 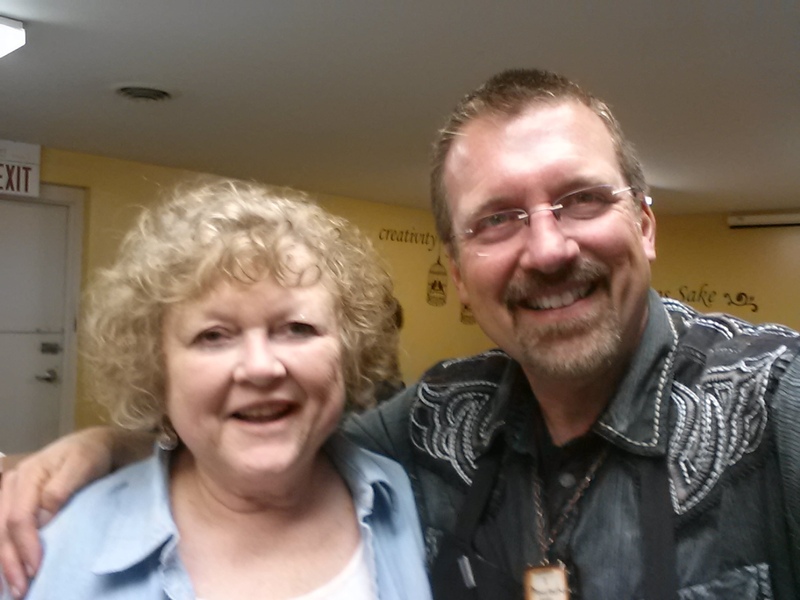 So, when are you coming to Atlanta GA? Hey Itz, thank you so much! The photo of your daughter would be a perfect personal history to share...I'll be back in the U.K. next month...I hope that one of the stores will be near you...I'd love to see the story you tell with Media Mixage. These all look so personal and unique. 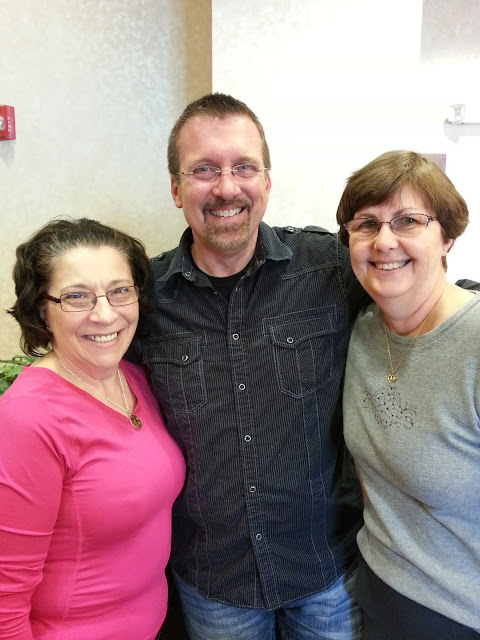 Must have been a wonderful workshop experience. 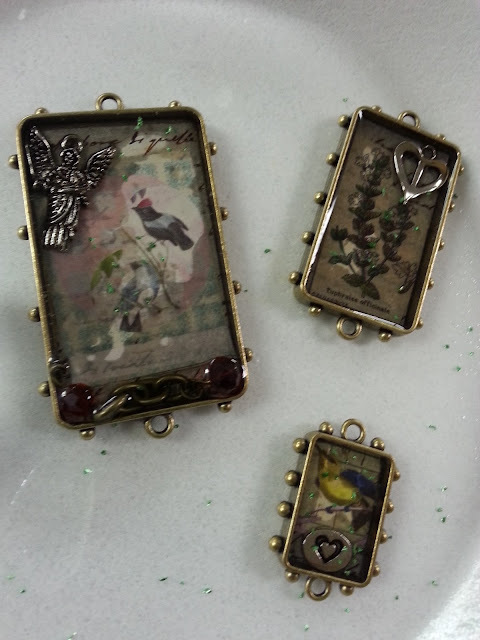 I have found your Blog, Ken, via Christine Emberson, just had to tell you that these bezels and ice resin projects are absolutely stunning, this is another 'must have' ha ha, I love anything 'vintage' and these really 'sing to me'. Thank you for the inspiration. 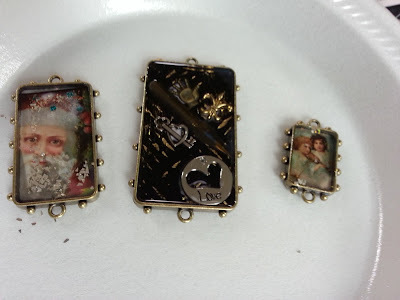 Thank you Patricia, I am so honored that Christine shared my blog today...and thrilled that she shared class projects. 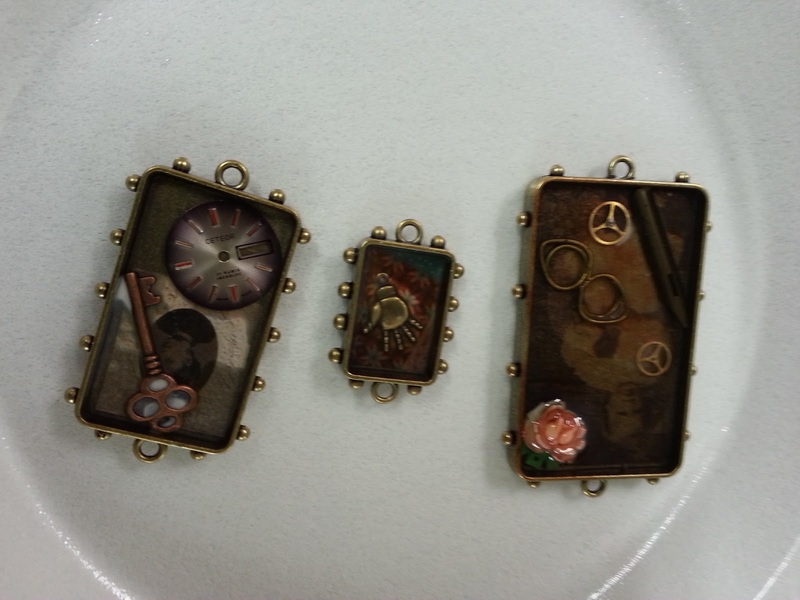 The artists who were at the workshop were amazing and I love how each of the pieces they created shared personal stories. You will love working with Media Mixage from Spellbinders...you'll be amazed with the art you can create. Thank you again...and please feel free to share a pic of your creations to my facebook wall...I cannot wait to see what you create. Creative classrooms don't simply appear to be unique, they feel extraordinary. Such activities under control of essay writer give an environment where students will probably express their thoughts, consider unheard of options, challenge issues with imaginative arrangements and in particular – learn quicker and more effectively.